Backing pads, back-up pads, Spiralcool pads, disc pads, disc backup pads, disc pad holders. Scroll down for pads for smaller tool spindles. Purchaser assumes all responsibility for the safety of user and bystanders around the grinding operations. These backing pads are designed for abrasive discs with a 7/8" center hole. Pads thread onto one of three different tool spindles. Abrasive discs are shown on our Resin fiber discs and Resin fiber discs, heavy-duty pages. SAFETY WARNING: Make sure the maximum RPM of the backing pad you choose, is more than the RPM of the power tool you are using. Also make sure the maximum RPM of the abrasive disc you are using, is more than the RPM of your power tool. Spiralcool's slotted hub draws cool air behind the disc. Spiral ribs provide contact points forming channels for air flow, extending disc life 30% to 50%. These backing pads are ruggedly built, lightweight, and stay in balance. Rigid type backing pads are used for straight flat work. Medium or flexible backing pads are used for contours. Other general recommendations: Rigid for 16-24 grit discs, Medium for 36-60 grit discs, and Flexible for 80-120 grit discs. Disc nuts are not included with these pads. Order center nut separately from the accessories listed below. 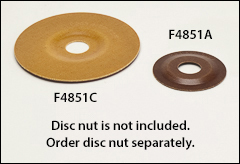 Center nuts are available for different abrasive disc diameters. Spiral rib face pad, threaded bore with 5/8"-11 internal threads. The backing pad threads onto the tool spindle, and the center nut holds the abrasive disc onto the backing pad. For discs with 7/8" center hole. Disc nuts are not included with pads. Order disc nuts separately from the accessories listed below. Two sizes of center nuts are available, for different abrasive disc diameters. Spiral rib face pad with unthreaded 5/8" bore. No nose on back side of the hub, but the same spiral rib face as backing pads above. These "flat back pads" are used on tools with a shorter spindle. 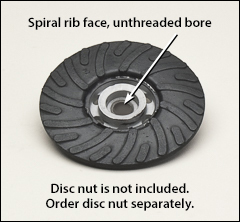 Instead of backing pad threading onto tool spindle, the center nut holds the disc and the pad onto tool. Disc nuts are not included with these pads. Order center nut separately from accessories listed below. Two sizes of center nuts are available, for different abrasive disc diameters. Smooth face high speed pads, threaded bore with 5/8"-11 internal threads. Used on high speed sanders. The backing pad threads onto the tool spindle, and the center nut holds the abrasive disc onto the backing pad. For discs with 7/8" center hole. Disc nuts are not included with pads. 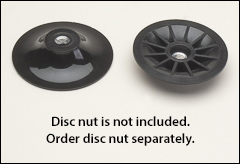 Order disc nuts separately from the accessories listed below. Two sizes of center nuts are available, for different abrasive disc diameters. F4825 and F4826 center nuts both have 5/8"-11 internal threads. The difference between these center nuts is their flange diameter. F4825 has a 2" flange diameter. F4826 has a 1 1/2" flange diameter. 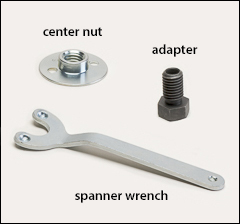 The F4829 spanner wrench fits both of these center nuts. The fixed pin Spiralcool spanner wrench shown above does not fit all the other backing pads on this page. But this adjustable wrench pivots to allow the two pins to fit multiple different disc nuts. Firm plastic backing pads with 5/8"-11 internal metal threads and heavy-duty grinding supports. The backing pad threads onto the tool spindle, and the disc nut holds the abrasive disc onto the backing pad. For discs with 7/8" center hole. Disc nuts are not included with pads. Order disc nuts separately. with internal 5/8"-11 threads. The backing pad threads onto the tool spindle, and the disc nut holds the abrasive disc onto the backing pad. The nut included with the pad is not available as a replacement. The F4850N disc nut is a heavier-duty replacement. This pad is used with abrasive discs with a 7/8" center hole. Reinforced phenolic backing plates with 7/8" depressed center hole. A smaller size plate can be stacked behind a bigger plate for more rigidity. Disc nuts are not included with plates. Order disc nuts separately, to fit your tool spindle size. 3" and 41/2" fiber backing discs. Each pack contains three 3" diameter discs and three 4 1/2" diameter discs. If a 5" abrasive disc is used, both the 3" and the 4 1/2" fiber backing discs must be used together. 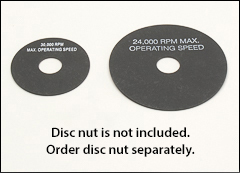 These backing discs are used with abrasive discs with a 7/8" center hole. Disc nuts are not included with backing discs. Order disc nut separately, to fit the tool spindle you are using. Maximum RPM: 30,000 for 3" fiber discs and 24,000 for 5" fiber discs. 5" plastic backing pad with internal 3/8"-24 threads. The backing pad threads onto the tool spindle, and the disc nut holds the abrasive disc onto the backing pad. The disc nut included with the pad is not available as a replacement. The F4850N disc nut is a heavier-duty replacement. This pad is used with abrasive discs with a 7/8" center hole. 5" plastic backing pad with internal 7/16"-20 threads. The backing pad threads onto the tool spindle, and the disc nut holds the abrasive disc onto the backing pad. 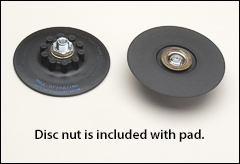 The disc nut included with the pad is not available as a replacement. The F4850N disc nut is a heavier-duty replacement. This pad is used with abrasive discs with a 7/8" center hole.